A few weeks ago, director Susie Baer Collins had the privilege of being on Dave Wingert's morning show on KGOR to discuss The Lady with All the Answers. The video below is the audio from that interview paired with images from the play, the lobby display and promo photos. Tonight is opening night of The Lady with All the Answers and opening night of the 2010-11 season! To get you excited for the play, here are some great feature articles and photos from the play! It's like an Omaha arts and culture smorgasbord. 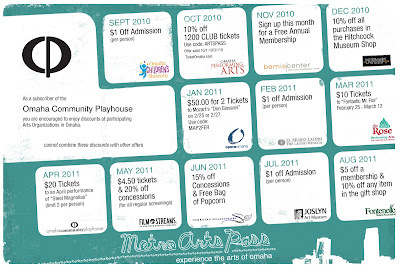 The Metro Arts Pass is a fancy little card that gives you discounts at arts organizations around Omaha. Every month Metro Arts Pass holders get to enjoy a unique deal at a different organization. So how do you get one of these passes? Become a member or season subscriber to at least one of the participating organizations. Season subscribers at the Omaha Playhouse receive a season subscriber card and only need to show it at participating locations to receive the monthly deal. 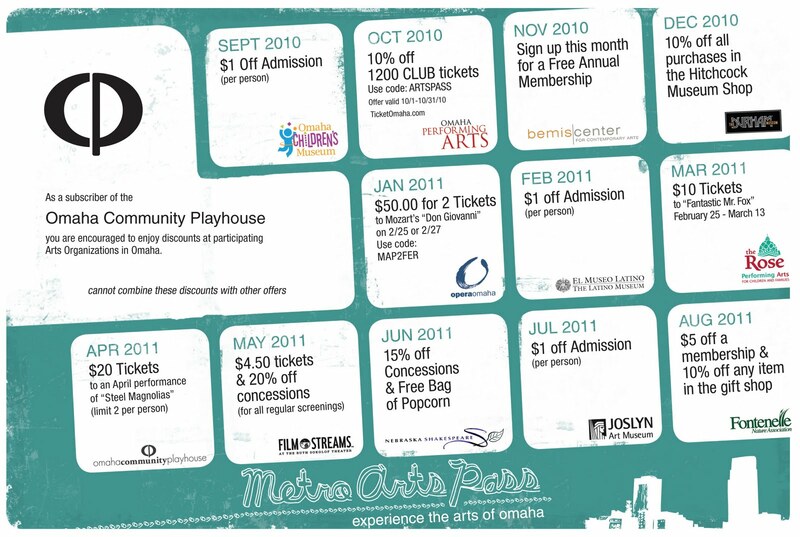 For questions regarding the Metro Arts Pass, email the Playhouse's Director of Sales at mkarbowski@omahaplayhouse.com. Playhouse Partners Make a Difference! Did you know that our productions and programs are not entirely paid for by ticket sales? Generous donors help make up the difference so that the Playhouse’s high-quality entertainment and educational opportunities can remain affordable for the community. The Playhouse would like to thank and recognize the following sponsors of our upcoming fall productions. Please thank these generous donors if you see them, or patronize their businesses. Their support is pivotal to the success of the Omaha Community Playhouse! Sponsored by: Peter Kiewit Sons’, Inc., Tenaska, Ron & Teri Quinn and Lamp, Rynearson & Associates, Inc. Snow and Special Effects Sponsor: Valmont Industries, Inc. If you would like more information on how you or your business can become a show sponsor, contact Alena Furlong, Development Director, at 553-4890, ext. 127 or afurlong@omahaplayhouse.com. Are you looking for a way to become more involved with the Omaha Community Playhouse? ACT II offers many great volunteer and social opportunities that will enrich your Playhouse experience. 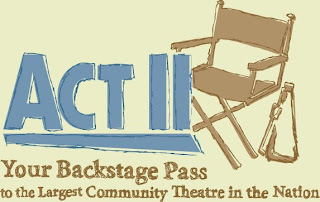 The 2010-2011 ACT II calendar is packed with fun events. The year starts off Monday, Sept.20, with the Fall Kickoff Luncheon featuring entertainment from Footloose, The Musical. ACT II is also sponsoring a trip to New York Oct. 1-3, which includes tickets to two Broadway shows ― it’s not too late to sign up for this fabulous adventure! Behind-the-Scenes events hosted by ACT II are great ways to learn more about the workings of the Playhouse and offer special insights about the plays on our stages. The first of these events will be Thursday, Oct.14, and will give attendees a glimpse behind the scenes of A Thousand Clowns. Other Behind-the-Scenes events will be held throughout the year. Don’t miss ACT II’s largest event this fall ― a Holiday Tea & Fashion Show on Saturday, Nov. 20. We hope this event will become as much a part of your holiday traditions as an evening at A Christmas Carol. Watch for more details coming soon. After the holidays, the fun doesn’t stop! Spring will bring another new ACT II event ― ACT Out! Children’s Workshops. This day-long event is designed to introduce children to the excitement of live theatre. Also our very popular Destinations: World’s Fare Benefit will be held Saturday, April 9, 2011. Guests experience the food and entertainment of different countries around the world as only the Omaha Community Playhouse can do. ACT II has a very full and exciting year in store! Many volunteers are needed to make these events successful. 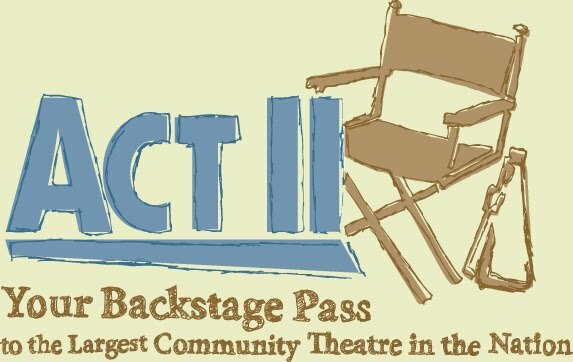 Although you can attend most ACT II events even if you aren’t a member, we encourage you to join ACT II to really maximize your volunteer and social experience. If you are interested in learning more about joining ACT II, join us Tuesday, Sept. 7, for a New Member Orientation, or, for more information, contact the ACT II Liaison, Jan Fry at jfry@omahaplayhouse.com or 553-4890, ext. 145. The Omaha Community Playhouse is pleased to announce that it is now part of the TICKET OMAHA consortium. TICKET OMAHA provides a one-stop shopping experience for live performing arts in Omaha. TICKET OMAHA currently provides ticketing services for Omaha Performing Arts, The Omaha Symphony, Opera Omaha and starting in August 2010, the Omaha Community Playhouse. 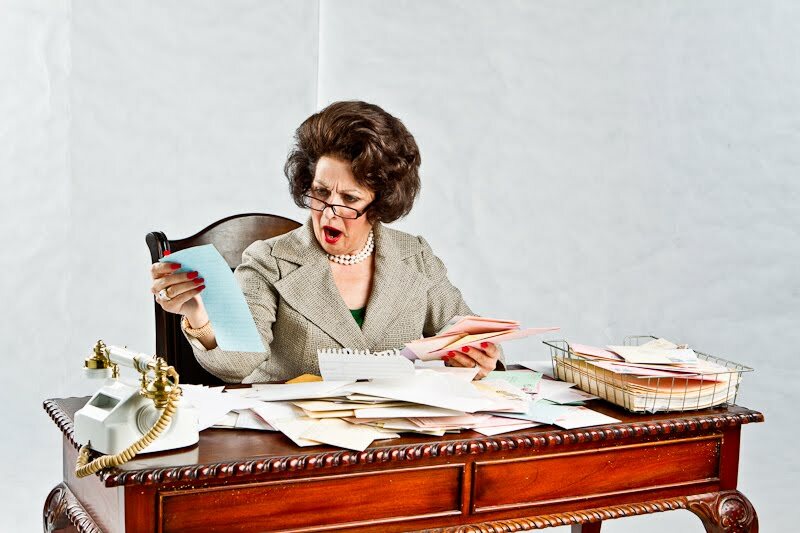 Subscriber tickets and single show tickets to all Omaha Community Playhouse events will continue to be available through the OCP Box Office by visiting 6915 Cass St. or calling (402) 553-0800, but single show tickets are now also available downtown at TICKET OMAHA, 1200 Douglas St, at www.ticketomaha.com or by calling (402) 345-0606. When placing single ticket orders online, purchasers will be re-directed from OCP’s website to the TICKET OMAHA site for purchase. Fees will be added to all online orders and phone orders at TICKET OMAHA. No fees will be added if purchased through the Omaha Community Playhouse Box Office. Also Appearing Daily in the Owen Lobby! Photo by Malone and Co. The Omaha Community Playhouse has the opportunity to create an exhibit about your life and work. Ann, for more than 40 years, you were the world’s best read and most widely syndicated newspaper column, a fixture in 1,200 newspapers, offering a daily snapshot of a society in transition to an audience of some 90 million readers. 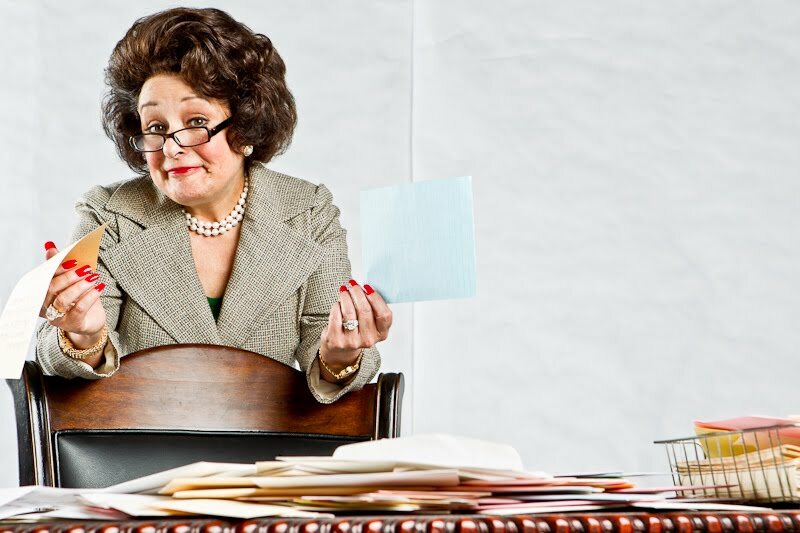 This exhibit will be shown in conjunction with the Playhouse’s upcoming production of The Lady With All The Answers, David Rambo’s highly entertaining, warm-hearted and moving one-woman play all about you! What do you think? What do I think? That’s fantastic! The Owen Lobby Exhibit is entitled: Ann Landers: A Lady Who Will Live in Intimacy. 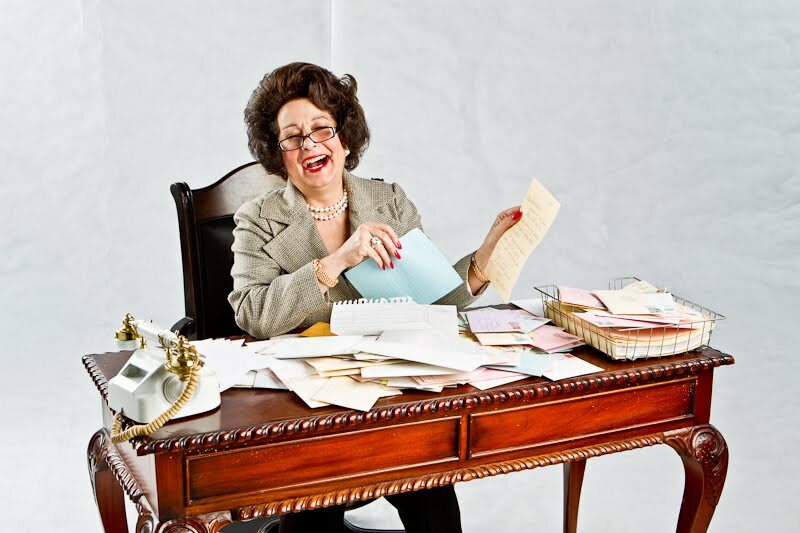 It will include a variety of Ann Landers facts, photos, quotes, quips and even a video segment, shot during your special stage performance at the Omaha Press Club Show. This lobby display would not be possible without the generous support of the Omaha World-Herald, who featured your daily column for many years and who soon will be celebrating their newspaper’s own 150th Anniversary! I can’t wait to see it! Now, tell me about the play! For more 40 years, Ann, you answered countless letters from lovelorn teens, confused couples and from a number of individuals with “nowhere else to turn.” You gave witty, frank, straight-forward and informed advice, all while creating an intimate dialogue with your readers. The first to address a myriad of “taboo topics,” you helped shape the social and sexual landscape of the latter half of the 20th century. No topic was off limits for you, Ann ― known in real life as Eppie Lederer, one of two identical twin sisters who grew up in Sioux City, Iowa. Both of you became widely-read advice columnists, your sister, a mere 17 minutes younger, was Dear Abby. Ann, you welcome us into your world, as we become an audience of your “dear readers,” sharing your history, triumphs, gossip and heartbreak. I couldn’t have said it better myself! 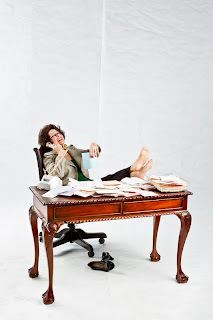 Don’t miss The Lady With All The Answers ― or the exhibit, Ann Landers: A Lady Who Will Live in Intimacy ― Aug. 20–Sept. 19 in the Howard Drew Theatre. Get those tickets, Bub, or else . . . it’s fifty lashes with a wet noodle!